Garnet black color. Savory, fruity aromas and flavors of dried berries and chocolate yogurt and toffee with a silky, bright, fruity medium body and an even, delightful, breezy finish with nuances of sour cherries and apples, vanilla nuts, orange chiffon, and cedar with well-integrated, chewy tannins and light oak flavor. A precise, chewy red blend that is sure to please. Bottom Line: A precise, chewy red blend that is sure to please. 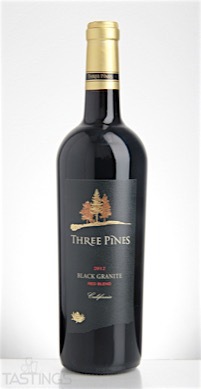 Three Pines 2012 "Black Granite" Red Blend, California rating was calculated by tastings.com to be 89 points out of 100 on 8/19/2016. Please note that MSRP may have changed since the date of our review.